Ok so October 15th is National Mushroom Day! (Who knew?!?!). This is a favorite food of mine! We have mushroom infuse oils, varieties of mushrooms that we laid our food with... Yum! Fungus is such Fun!! It's cute, too!! Our Hostess Stamp Set, Happy You is toooo cute to pass up! 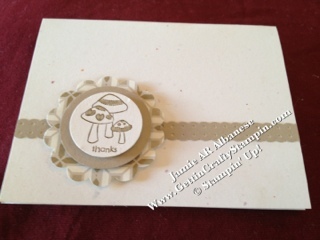 Here we create a Nuetral, Monochromatic Mushroom card using Naturals White cardstock as the base, Soft Suede ink to stamp the image, Comfort Cafe DSP, Crumb Cake paper and Stampin' Write Marker it's an easy and soothing card! Nabbing my 2 3/8" scallop, 1 3/8" circle, 1 3/4" circle and Dotted Scallop Ribbon Border punches I layered with Stampin' Dimensional adhesive. An easy toast to a fun fungus that does sooo much for us! I hope you enjoy this lovely card. The LNS ladies challenged us to use "white space" in our cards this week. Here is my minimalistic natural and neutral Mushroom Thanks card!